I am really looking forward to telling you about the last two days, but John is here, so I want to hurry up with my work so I can spend as much time with him as possible. I’m about to get started on some granola for him, so I thought I’d share the recipe. Honestly, this granola is the best ever. I stole the recipe from one of my mothers-in-law years ago…although she still lovingly sends batches of the granola to John–don’t worry, Leslie, he still can’t get enough! Ahhhhh…I love foods that are easy to prepare and easy to please. Alon calls it my magic granola. Thanks to him, they are now making it in Israel. Try it in your kitchen! Mix dry and wet ingredients, then spread on a jelly roll pan. Bake at 325 F. for 30-40 minutes, stirring occasionally. When cool, add 3/4 cup raisins. Mix dry and wet ingredients, then spread on a jelly roll pan. Bake at 325 F. for 30-40 minutes, stirring occasionally. When cool, add 1 cup raisins, 1/2 cup dried apricots, and 1/2 cup pitted prunes. Experiment with some of your favorite nuts and dried fruit! I recommend always including some almonds, sunflower seeds, sesame seeds, and raisins, but John and I have incorporated similar quantities of dried cherries, dried strawberries, dried blueberries, dates, hazelnuts, macadamia nuts, pecans…and you what? It’s never lasted that long in our house; somehow we always manage to swallow it down. If you want to get really REALLY crazy, spice things up with some cinnamon, nutmeg, and allspice, or maybe some vanilla. You can’t go wrong! To save time, I once mixed the dry and wet ingredients together all at the same time…BIG mistake. And, while I love my French Blue KitchenAid Mixer with my whole heart (I’ve written haikus in its honor), this recipe does not work well in the KitchenAid…just a good ol’-fashioned bowl and a spoon works best. 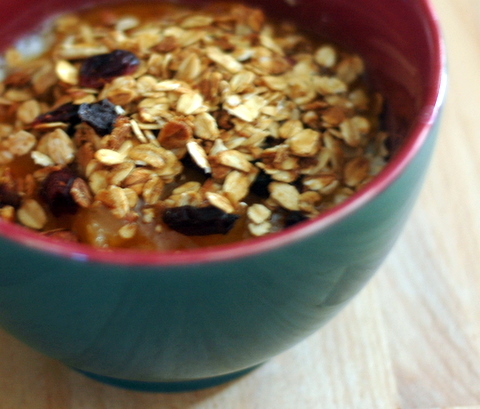 And, if you’re not sure, take the granola out early…it should be slightly golden. Oh my, yes, I do love your granola! Yum. I think I’ll make a batch this weekend. Ted! That is the most wonderful news to hear while studying GI. I’m so glad you like it. Please give Alison a hug for me!